When legendary frontiersman Kit Carson came to Washington D.C., he was wined and dined by many local political luminaries, including Secretary of War William Marcy. From the point of view of the guest-of-honour at the dinner held for him in Secretary Marcy’s home, the evening was not a great success. According to an account described in Hampton Sides’ excellent history of the conquest of the American West Blood and Thunder (2006) Carson ‘picked at his fish and fowl drenched in rich sauces’ and ‘passed on the fine French wine’. He did, however ‘appear to enjoy his ice cream and cake.’. By her kindly intended informality, Mrs. Polk demonstrated that the nicest way to honour a guest is not to impress him, but to show that you care about his druthers. This post introduces the recipes included in a new menu: A July 4th Dinner under the Desert Sky. The general consensus among those who follow American dining habits is that they have become more sophisticated in recent years. Whether or not this is so, it is fair to say that traditional American holiday fare is largely ‘down-home’ in character. This is true, regardless of region or ethnic origin. 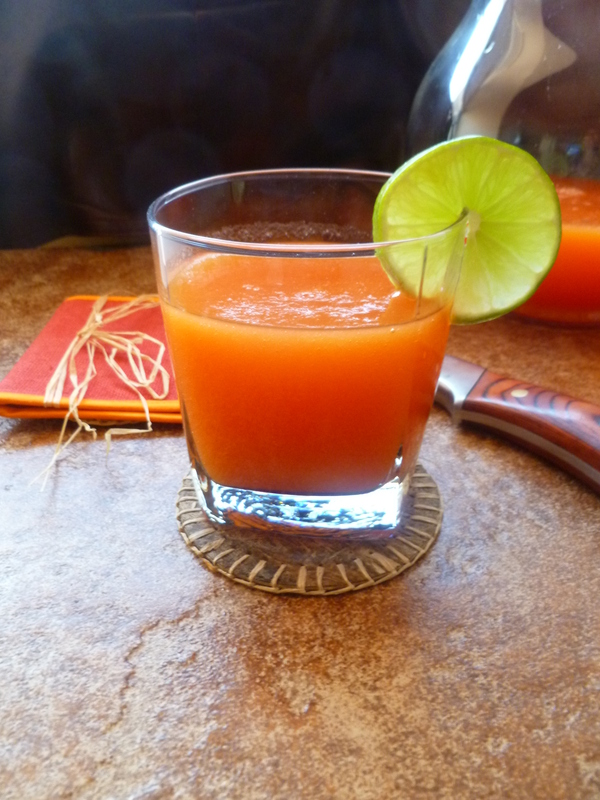 Papaya Aqua Fresca is a drink haling from Kit Carson’s adopted home in the American Southwest, or, rather, from the Hispanic culture of which it richly partakes. It begins this present day informal evening Menu… And, being a July 4th dinner, it seems fitting that the menu should not be derived exclusively from one region and that it should be….’down-home’. 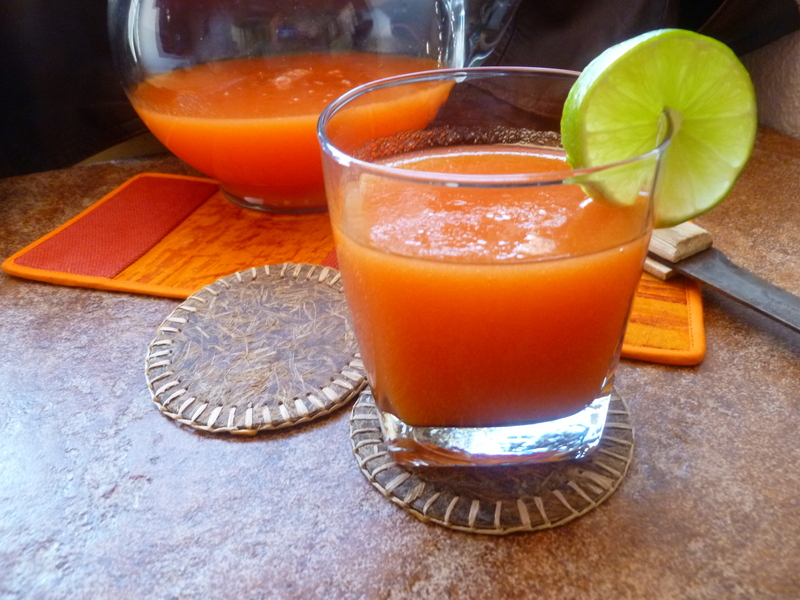 Timing Note: Papaya Aqua Fresca should chill for at least 30 minutes before serving. 1. Cut the papaya in half. Scoop out the seeds with a spoon and discard them. Peel and cut it up the fruit into chunks. 2. Make the drink in two batches, since even a large, professional-size processor is likely to leak if the whole amount is processed at once: Add to the processor or blender half the papaya, 3 cups of water, 1 Tablespoon of lime juice and 3 Tablespoons of sugar. Process until the mixture is very smooth. 3. Place a large strainer over a mixing bowl. Pour the Aqua Fresca mixture into the strainer and rub it through the wire mesh of the strainer with the back of a wooden spoon. 4. Make the second half of the Aqua Fresca in the same way, adding it to the first batch in the mixing bowl. 5. Pour the Aqua Fresca into a large pitcher and chill it for at least 30 minutes…longer is even better. 6. Hook a round of fresh lime on the rim of each glass of Aqua Fresca…Some guests may like a glass of Aqua Fresca and then move on to something else…perhaps a beer, a glass of wine, or Kit Carson’s preference…a whiskey. Others might stick with the Aqua Fresca. This recipe makes 6 large-ish glasses and is easy to increase. 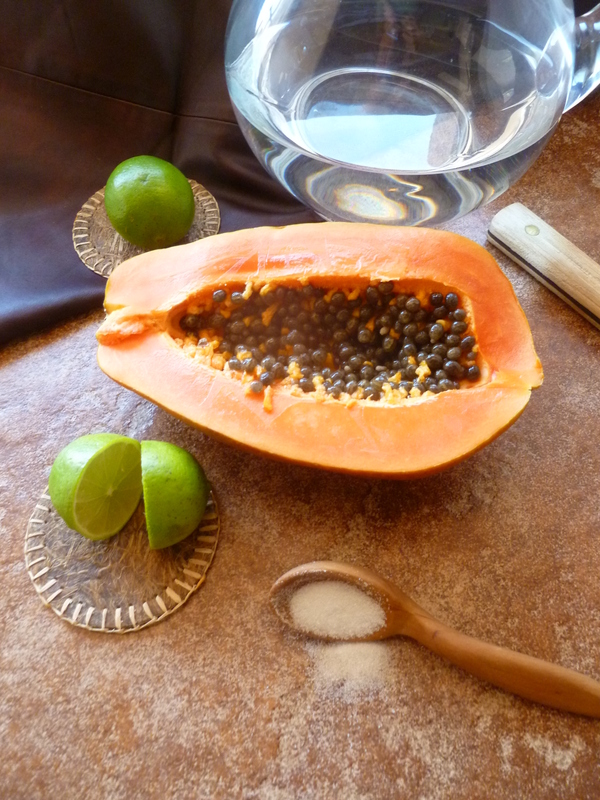 A Note: Papaya Aqua Fresca is served before dinner in: A July 4th Dinner under the Desert Sky. Yum, this sounds soooo goood! 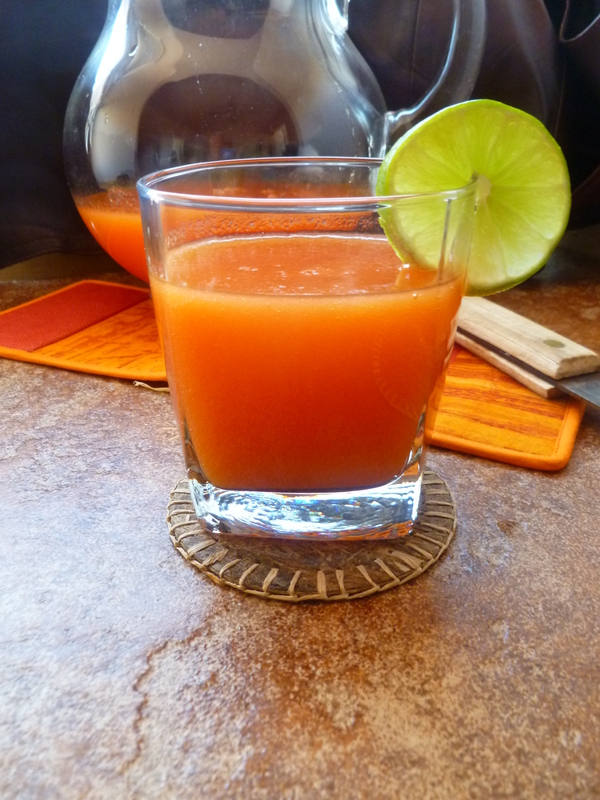 It is 39 C here and it’s only 9 am… I guess you are used to that, hence cool aqua fresca !